I Wish My Wife Would Get This Dirty custom wheel cover. Have trouble keeping the car clean? This one is for you! Our standard range of covers are pre-printed in batchs to reduce costs. 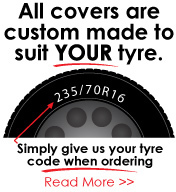 Designs of our standard range on our web site are for illustration purposes and may appear slightly larger or smaller on the end product depending on tyre size. Please let us know if you would like to see a layout before going ahead.